Artist David Hockney Says The Drive To Create Pictures 'Is Deep Within Us' The nearly 80-year-old artist has written a book called A History of Pictures. It's chock-full of art he has loved looking at and includes one painter he credits with inventing Hollywood lighting. 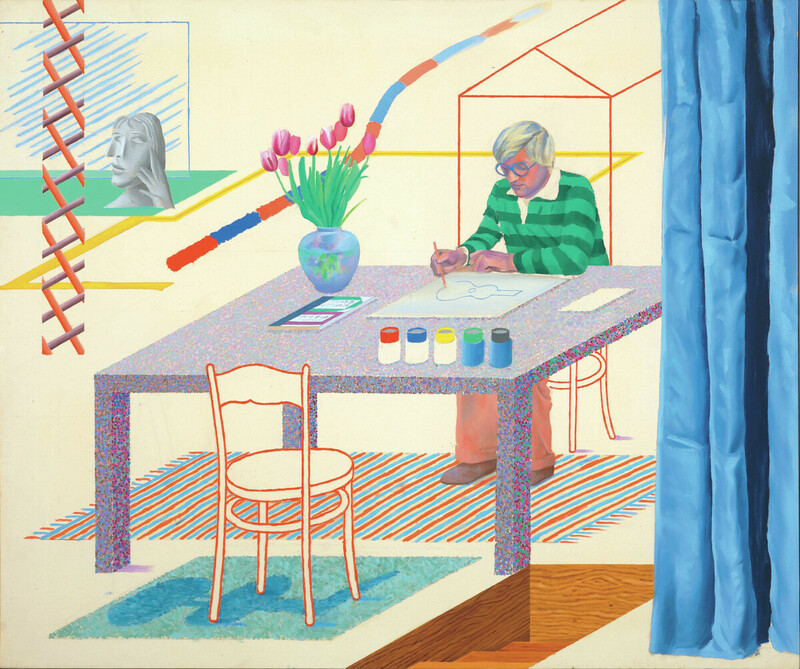 In a recent series of photographic drawings, David Hockney, shown above in his studio, plays with the relationship between painting and photography. 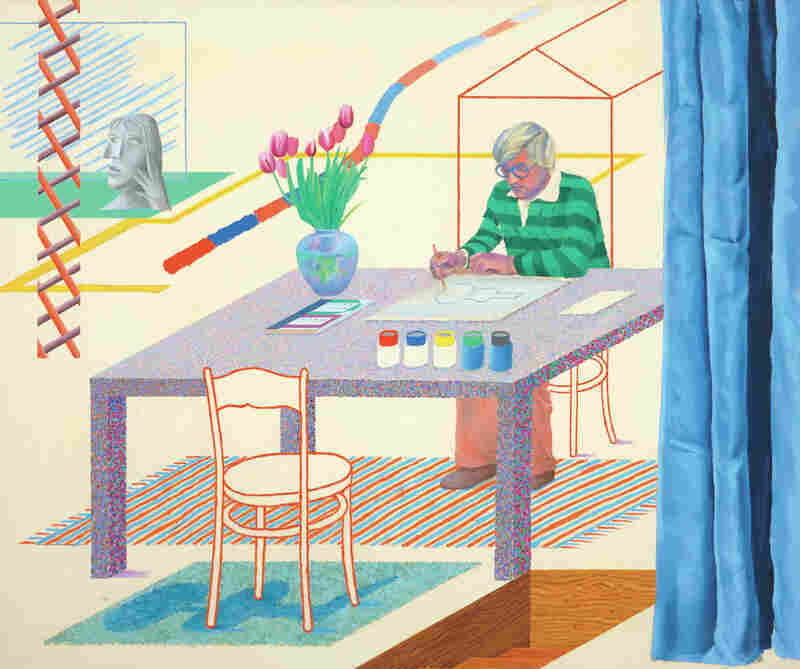 Artist David Hockney is obsessed with looking. He looks and looks, and then, in his works, he makes us see what he sees. The artist says looking and showing are as old as time. "I think the first person to draw an animal on a wall would have perhaps been watched by someone. And then, when he'd got the animal down, the person would've grunted or something, and said, 'I've seen something like that.' "
At nearly 80 years old, Hockney is busier than ever: He's the subject of a new documentary; he has a big retrospective in the works at Tate Britain; and he has a new book, A History of Pictures: From the Cave to the Computer Screen. Hockney believes making pictures is part of human DNA. "Very young people pick up a crayon and start to draw, don't they? Very, very young people," he says. " ... I think the idea of making pictures is deep within us." Today, swap crayons for smartphones and everyone's making pictures. They may not be artistic, but technically they're aces. 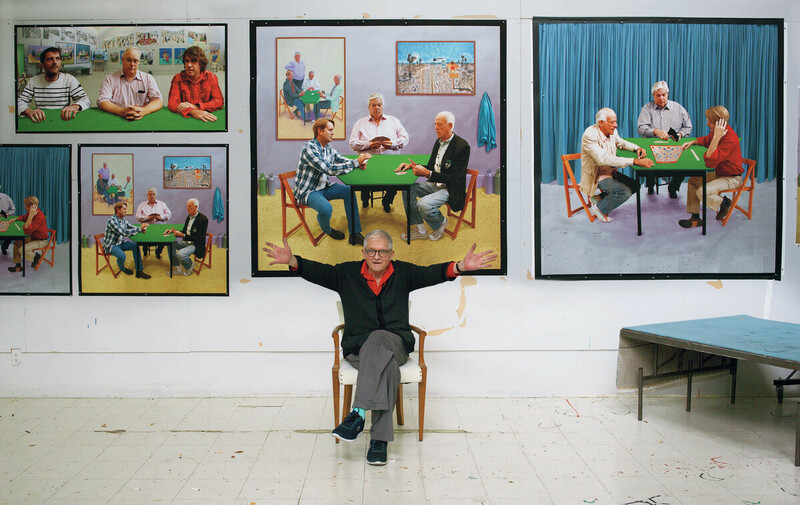 "You can't take a bad picture, really," Hockney says. "You can't take an underexposed picture; you can't even take an out of focus picture now. My father's pictures were — he used to take a lot of photographs and they were always a bit out of focus and underexposed. Always. And he died just before the automatic camera came in and the automatic focus. And he'd have been in his element then." 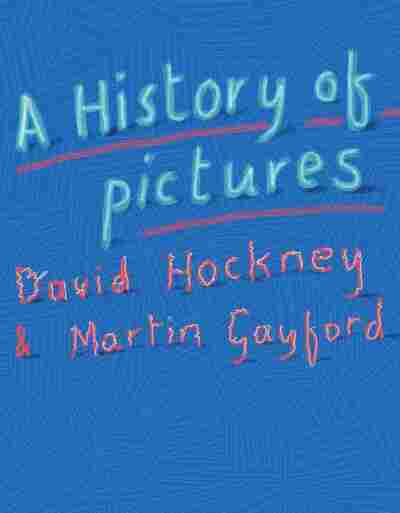 Hockney's A History of Pictures is chock-full of images — a few photos, but mostly reproductions of paintings he has loved looking at over the years. His favorite is a quick pen and ink drawing Rembrandt made in 1656. (You can see it here.) It shows a mother, a father and a sister teaching a child to walk. The jot of a curve makes a shoulder; a flick of the brush shows the father squatting, encouraging the child. Hockney thinks it's a virtuoso piece. "You see the tenderness of the drawing, I think. But you also see ... the marks that made the drawing as well," he says. "I mean, you can look at the mother and see the little ragged dress she has on, but then you see the marks that were made to do this and how few there are." The drawing is minimal and universal. "Any person anywhere in the world has seen something like this and experienced it," Hockney says. In addition to Rembrandt, Hockney is crazy for Pablo Picasso (his hero) and Caravaggio. He credits the late 16th-century Italian painter with inventing Hollywood lighting. 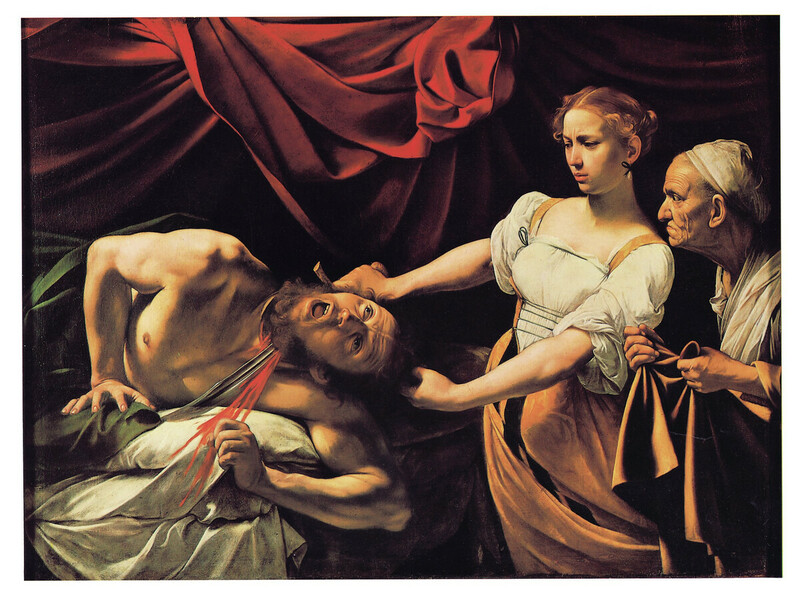 For example, Caravaggio's 1599 painting Judith Beheading Holofernes: "I mean, this is lighting that's not natural," he says. No sun could shine so brightly on Judith's breast and then disappear to make such dark velvety shadows right behind her. Only movies can illuminate like that. 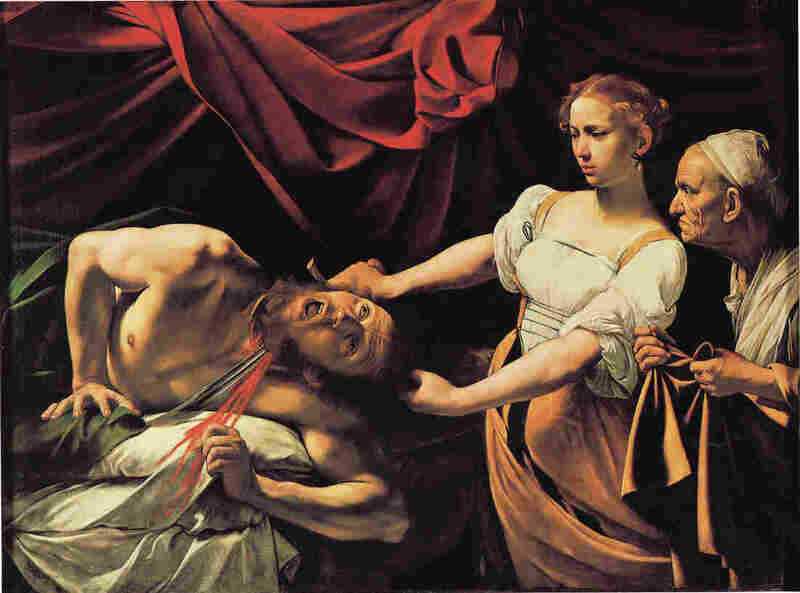 Hockney says late 16th century Italian painter Caravaggio "invented Hollywood lighting," as demonstrated (above) in his 1599 work, Judith Beheading Holofernes. "I do get a deep pleasure from looking"
Light, and where it comes from, is every painter's preoccupation. And for Hockney, light on water is a particular fascination. "Say a swimming pool: The water is transparent. How do you paint transparency?" he asks. "It's always a nice problem to me. ... Water in a swimming pool is transparent and it has reflections and things. That's what [it's] all about — reflections." Hockney is known for bright, flat paintings of Los Angeles and vivid English landscapes. His best-known painting — 1967's A Bigger Splash — shows a California swimming pool the moment after someone has jumped in. (You can see it here.) A tan diving board angles in from the bottom right and a lively white splash rises up from the aquamarine water. Hockney painted Self-Portrait with Blue Guitar in 1977. "I spent longer on the splash than on any other thing in the painting," Hockney says. "I spent about a week painting it because it's painted with small brushes. ... I mean I didn't want to just take a brush and splash it like that. I wanted to paint it slowly, and I thought, Then it contradicts the splash, really." Hockney says the first thing he looks at in anyone's painting is the surface, "the paint itself and so on. And then you might then see a figure; then you might see something else. But I think, first of all, you see the surface." It's a painter's way of looking. Someone else might look first at the pear, the face, the horse — but not Hockney. That artist believes painting can change the world. In the midst of all our miseries, he says, art lets us see the world as beautiful, thrilling and mysterious. "I do get a deep pleasure from looking," he says. "I mean, I can look at a little puddle on a road in Yorkshire and just have the rain falling on it and think it's marvelous. ... I see the world as very beautiful."